On Friday 19 October the big band Cotatcha Orchestra performed in HaDivadlo with an important foreign guest: the trombonist, composer and arranger Ilja Reijngoud. After the review of the concert we are now also bringing you an interview with this Dutch jazzman, holder of a Latin Grammy and other significant awards. Reijngoud answered our questions shortly before the Brno concert. You have a new album Jay & Kai Tribute And More, which you recorded together with another trombonist. How did this idea come up? This album is a tribute to two important musicians, J. J. Johnson and Kai Winding, and the important groups around them. I made the recording with the trombonist Bert Boeren, who is ten years older than me. Recently we have played a lot of concerts together and we worked together as teachers in schools in Rotterdam and Amsterdam. Each of us plays in a slightly different style – I am more modern while he holds to more traditional aspects. I last brought out an album with another trombonist some fifteen years ago and so I said to myself that maybe it is time for me to do something similar. Bert had from Kai Winding’s widow pieces that had never been published. We chose eight of his compositions, I arranged them, added three of my own new works and one by J. J. Johnson, and so we made the album. In such a project how do you divide up the two trombonists’ roles? 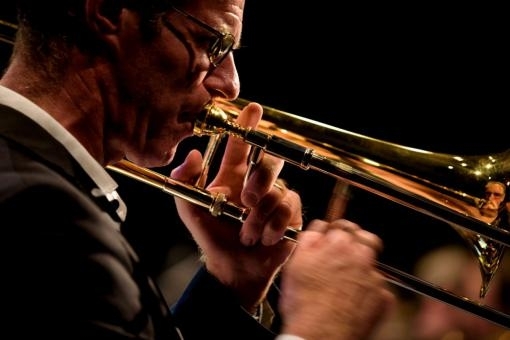 Trombonists record joint albums quite often, it is actually more common than with trumpeters or saxophonists. In this case there is such a big difference between me and Bert in our sound and way of playing that it was easy to decide for each of the pieces who it suited and so who would take the leading role, or in some cases where we would be equal partners. I was already thinking of it when making the arrangements. I thought about who out of the two of us would play something better. Of course I always think like this when arranging for a specific band. I don’t work in a way that I first write the music and only then invite the musicians to play it. I try to compose for concrete players. You have come to the Czech Republic as a guest of Brno’s Cotatcha Orchestra. How did this cooperation begin? Jiří Kotača studied the trumpet in Rotterdam, where I teach and also lead the student big band. Jiří also played in our big band for a while. When his year in the Netherlands came to an end he had one wish. That if we played at the Nord Sea Jazz Festival, he wanted to get back with us and play at this event. We performed at the festival, and Jiří came and played with us. And joking I said that in return he would have to invite me to a concert in the Czech Republic. Four years past and it happened. Jiří organised three concerts and two workshops for me. Already in our school big band Jiří got to like my music, which we used to play. He asked me then if his orchestra could play my works and whether I could play with them. That is how our cooperation began. How did you choose the repertoire? 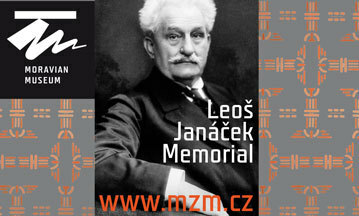 The specific works were chosen by Jiří. I understood that his orchestra has more projects – more traditional, modern and other. Our cooperation was to be a part of a modern project. He chose compositions which have a more modern character, that are less swing-like. There is one very old work and several more recent. Of course I had something to say on it, recommended something, but Jiří had the last word. What was your reaction to their choice, and to what the Brno musicians did with your music? Firstly I should stress that they are a really great band. And I am not saying that just to flatter them and get them to invite me back (laughs). Truly they are great players, what is more they are used to playing without a conductor in front of them. This means that they are sure of themselves, that they know exactly what they have to do, that they know the pieces they play perfectly. I always only counted the beat and here and there I said something about the dynamics, but that was all. Already on the first day, when I came and listened to their first rehearsal, and it sounded really good. One of your most successful projects was The Shakespeare Album, for which in the Netherlands you won an Edison award, the equivalent of the Czech ‘Angels’. Why did you put Shakespeare’s verse to music? My mother was an English teacher. She loved English literature – Shakespeare and also modern poets – as well as jazz and she tried somehow to put them together. I said to myself that I might try something similar. So I chose ten of my favourite Shakespeare sonnets and wrote music for them. It was rather demanding, because sonnets all have the same metre and the same number of verses. It was difficult to turn them into songs which were not all the same. I saw it as a great opportunity. When you put poetry to music, do you try to find music to go with the meaning of the words or to go against it? In the case of Shakespeare’s verse I tried to match the meaning of the words. I thought about what atmosphere or specific melody would match it. Otherwise I don’t often write music for texts that already exist. Sometimes I have written melodies to which afterwards my friends or my wife then wrote words, but that’s a little different. When you compose do you have some kind of story in your head? If I am to write music for existing words then of course I work with the story in the text. But as a jazz composer much more often I write music without words. You probably know well that the term jazz composition often has no meaning, it is a nonsense and I have been responsible for a lot of such nonsense. Shakespeare’s sonnets have no names, only numbers. I name my instrumental pieces for example according to what happened to me that day or that week. It doesn’t tend to be something serious. You took part in an album with the Brazilian composer Ivan Lins and his Metropole Orchest, which won a Latin Grammy. Is Brazilian or Latin American music important for you? Yes, but not just in connection with Ivan, on whose award-winning album I played only as a member of the trombone section of the orchestra. Aside from this I also worked with Ivan in a smaller line-up and as well I was a member of a smaller Dutch group that was directly dedicated to Brazilian music. I often play Latin-jazz together with the Dutch drummer Lucas van Merwijk, who has his own big band and other groups. I arrange for his orchestra Cuban and Porto Rican music for example. I feel more at home in Brazilian music than in these styles, though. As a jazz soloist of course I often play the “set works” of Jobim’s compositions, but these do not contain the complex rhythms and harmonies that Brazilian music offers. Its colourfulness is far more interesting than Afro-Cuban salsa. I play Brazilian music quite often, and I have also worked with the guitarist Nelson Faria and other Brazilian musicians, but I do not see myself as some great expert. What is the current situation with jazz in the Netherlands? Is it popular? The situation is good – jazz is on the rise. We have many good players and the schools are full of excellent musicians including foreign students. However since the economic crisis the market has stagnated. There are lots of musicians and they often do not have somewhere to play, even though music has a similar status with us to classical music. We have lots of music schools, perhaps too many - jazz is played in theatres, but there aren’t enough clubs. The album Jay & Kai Tribute And More has only just come out but are you working on something new? I always have some new project in my head. But the preparation of a new album brings together many activities. First you have to write the music, then put together a group and find the money. Then the album has to be recorded, mixed, mastered, a booklet prepared and printed … This CD came out three weeks ago and now I have to sell it. New projects will have to wait.